Known for his work on From Software titles like the Dark Souls series and Bloodborne, Miyazaki was presented the award by game luminaries Steve Jackson and Ian Livingstone. Miyazaki often credits the pair’s Fighting Fantasy game books like Sorcery! with fueling his interest in game design. While his speech was not incredibly emotional, Miyazaki was appreciative and quite willing to spread the honor among his colleagues, collaborators, and fans. It’s such a surprise and an honor to receive this prestigious Golden Joystick Award. I’m quite humbled. This award is not just my award. It goes out to everyone who has worked with me over the years making games, everyone who has shared this passion with me, and so I want to thank again everyone who has collaborated with From Software and everyone in From Software, our publishers, thanks again for everything. Thank you to my family for all of their support, and more than anything, thank you to the players, everyone who has played, enjoyed, and appreciated my games. It’s thanks to you, all the players, that I have been able to carry on making games with the one simple goal of making games that are interesting. And I am so glad to have been able to make games in these exciting times with all of you. I plan to carry on making games as long as I am able, and I will do my very best to make sure that they’re games that you will enjoy, so thank you for your continued support in advance. And, coming up very soon, we have Sekiro: Shadows Die Twice, which is due to be launched in March, so you can look forward to that. What I appreciate so much about this speech is how much he leans into cooperation and collegiality. The pseudo-cooperation of his games, and the root of those systems on a snowy hillside, seems to simply be a part of Miyazaki’s personality, and that’s a refreshing thing to see. 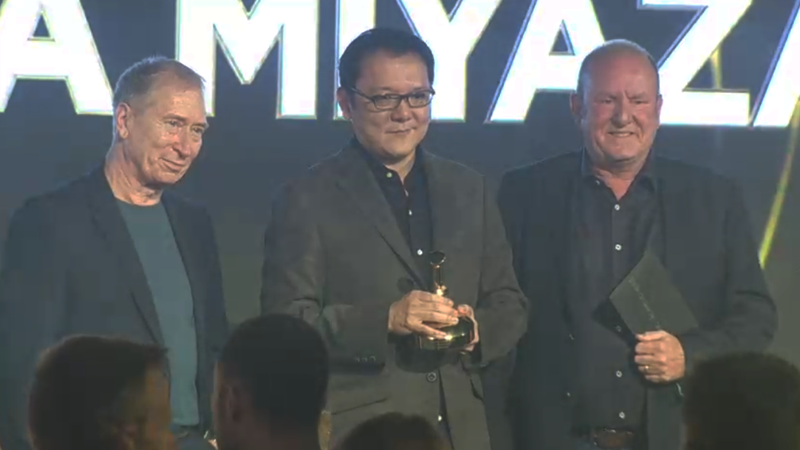 In winning the Golden Joystick Award for Lifetime Achivement, Hidetaka Miyazaki joins previous awardeesSid Meier, Eiji Aonuma, Hideo Kojima, Satoru Iwata, and Ken Levine.